Well, that was a surprise. 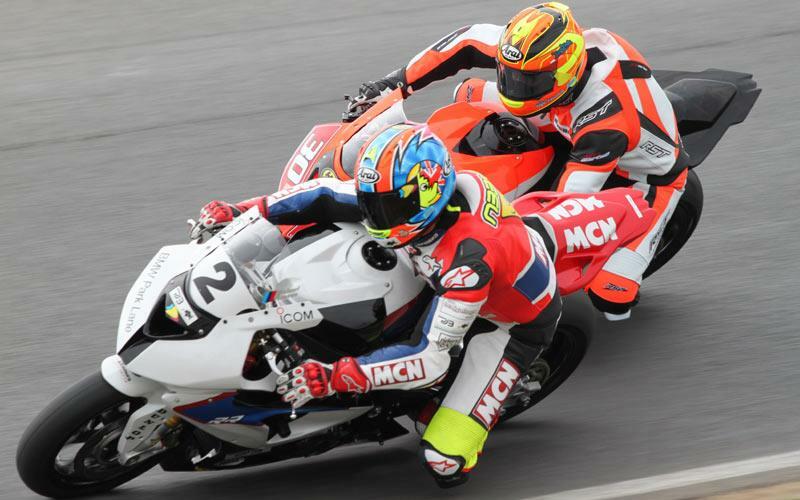 Three wins in Bemsee’s new Respro Premier 1000 class at Snetterton 300, a fastest lap and a pole position in the new BSB-style races - grid positions are set from the lap times of the previous race and there’s a qualifying session for the first race. Not a bad way to start the season. It’s been a tough winter break and I had all the usual nagging doubts, like whether I would still be good enough to race and if it was really a good idea doing it at all at the grand old age of 42. I also had an operation on my right knee just before Christmas, to try and get it to bend properly after a big bike crash in 1994. As yet it hasn’t worked and I’m still struggling to get my foot on the pegs properly. I regret having it done. It’s more a problem on a normal bike, as I’ve got a nice tall seat on my racing Beemer, but it still hurts like buggery when I ride. The knee has also stopped me being able to run and exercise properly, so the only way to keep to my new racing weight (which is three stone less than last year) is to be permanently hungry! Despite all this I managed to go two seconds a lap faster here at Snett 300 than last year, with a best of 1:55.4. A lot of this is down to the bike, set-up and light weight, but most from tips from Simon Crafar’s Motovudo book and DVD. 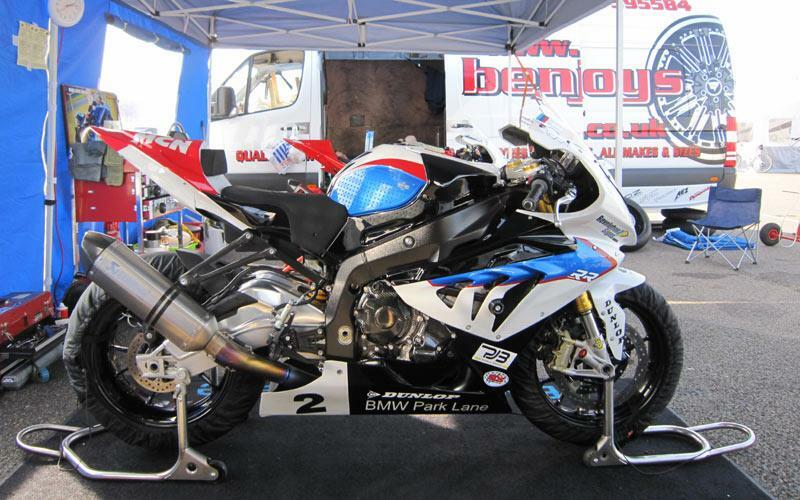 I’m running a new BMW Park Lane-sponsored S1000RR in this year’s championship, which is fantastic. The road bike is a big leap up from the old one, but with the things you change for racing (like suspension and gearing etc) the step isn’t as dramatic, but obviously still really useful. One of the best new toys to play with is the new BMW HP 2D datalogger. It’s an eye-opener being able to look at what the bike has been doing when you’ve been out on-track and it’s immediately useful for deciding with gear to be in and choosing overall gearing. There’s loads more it can tell you once I’ve figured out what it all means. There’s also a green light on the dash, which lights up when you’re up on your section times. So, now there’s a lot going on when you’re riding: that green light, the traction control light (to check you’re pushing as hard as you can), lap times, rev-counter, gear position…and where you’re going! One of the other advantages of the new bike is its electronic engine braking control, which makes corner entries much smoother. Thanks to the help from Kais (www.kais-performance.com), I’ve got a new Ohlins steering damper to keep the Beemer in check and the harder I ride, the more I’m figuring out what to do with the suspension, the better it’s getting and the faster I go. It’s a satisfying upward spiral. 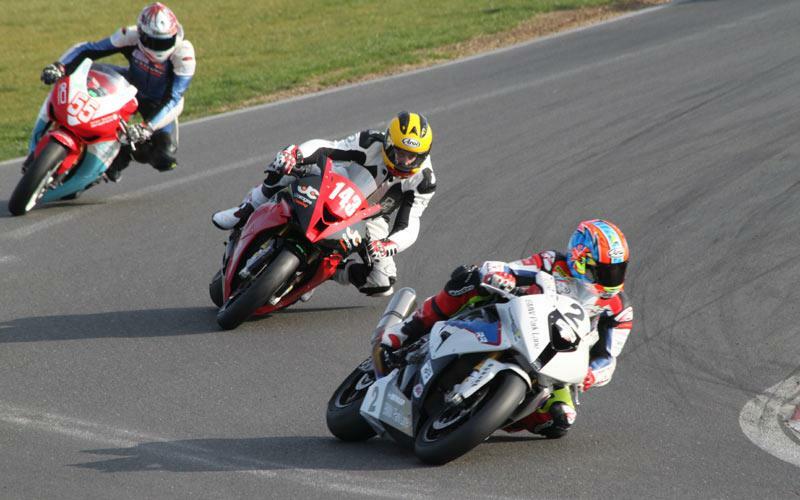 I had some great battles over the weekend with super-quick Danny Fowler on his ex-Tristan Palmer Blade and with fellow 2012 S1000RR-riding Jon Waghorn and Seb Bulpin. 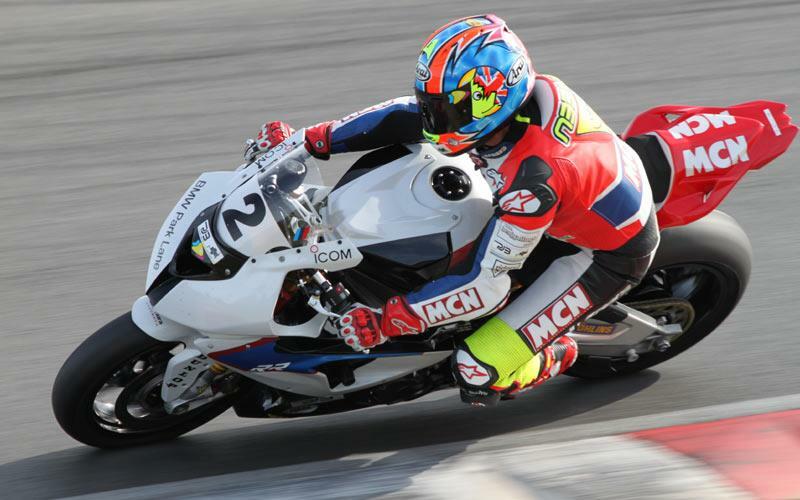 My younger brother Ben also had some good rides on his 2010 S1000RR, scoring a second in Saturday’s feature race. So, the season has started at last and it’s great to back out racing again. 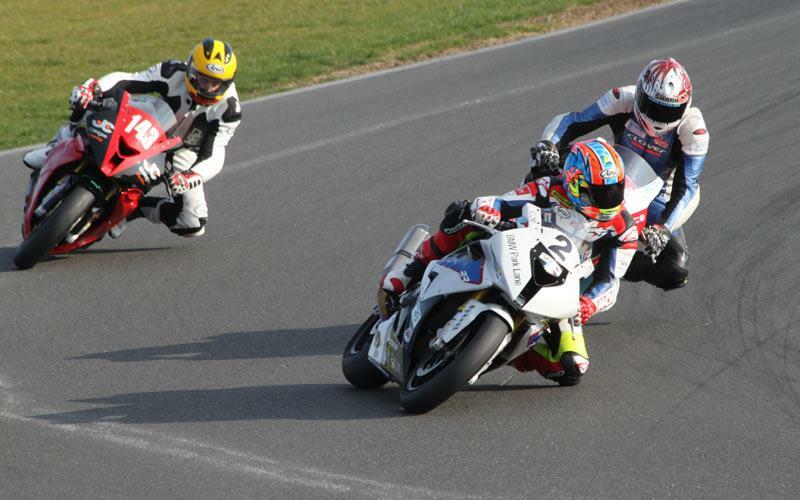 Roll on the next round at my home track Brands Hatch on 14/15th April. Engine: Liquid-cooled, 999cc, inline-four-cylinder, 16v, DOHC. Six gears. STM slipper clutch. Electronics: Traction control, four riding modes, racing ABS, HM Racing quickshifter. HP Power Kit, HP Calibration kit. HP datalogger. 2D timing beacon for standard on-screen lap timer. Suspension: Fully adjustable 46mm upside down forks with Ohlins 30mm cartridge kit and single Ohlins TTX2 rear shock. Ohlins steering damper. Front brake: 2 x 320mm discs with four-piston Brembo radial calipers. ABS. SBS Dual Sinter or Dual Carbon brake pads. Rear brake: 220mm disc with twin-piston caliper. ABS. SBS racing pads. Front wheels and tyre: 120/70 x 17. Dunlop Ntech slick. Standard wheels. Rear wheels and tyre: 195/65 x 17. Dunlop Ntech slick. Standard wheels. BMW Park Lane, Dunlop, Revolution Signs, Kais Performance, SBS, Arai, Alpinestars, PJB Technical Services, Icom, The Mercer, Rookie, Locks of Sandwich Cycles, Jimbo, Benjyalloys, Garnell Nutrition and Motovudu.